“Swill”. And if this is not that, than I need to seriously consult a dictionary and do more reading. What clap trap. What BS and politically correct nonsense this is. Folks who have been reading BMEWS for awhile and even over years, are familiar with the Traveller/ Gypsy problem not just here in the UK, where it can get pretty bad believe you me. But all over Europe as well. You just can not imagine, if you are reading this in the USA, how it’s possible for a group to cut locks on gates and simply move on to land both public and private. Of course in the USA, there are ways to get ppl off your property pretty quickly. Over here it can and it has, taken ten long years in courts. So anyway …. the cops see these life forms who I hate to refer to as people thus implying they are actually human, and must deal with them daily. And not just them but those other life forms in the form of human right activists. Why the hell does anyone wanna be a policeman anymore? An alarm was raised? Oh dear. The F****** sky must be falling. 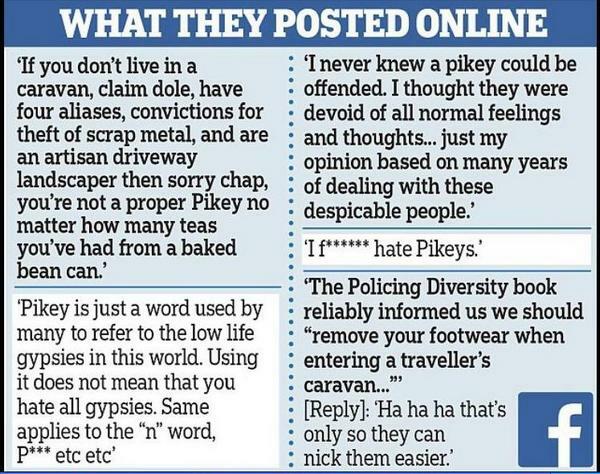 Police used a secret online forum to make offensive comments about ‘pikeys’, it was claimed last night. Scotland Yard is investigating reports that a private Facebook group, called ‘I’ve Met The Met’, was used to exchange racist views about travellers. Anti-corruption officials were called in after some of the 3,000 members, who include serving and retired officers, raised the alarm. Attention was first drawn to the forum, which is hidden from public view and managed on an invite-only basis, three months ago. Named ‘I’ve Met The Met’ after a fondly remembered 1980s public safety promotion, it serves as an unofficial online forum for the ‘police family’. But several racist comments appear to have been made during a light-hearted discussion of controversy over the use of the word ‘pikey’. The slang term, which refers to gipsies and travellers, was once widely used but is now considered unacceptable. Both groups are officially recognised as ethnic minorities, meaning discriminating against them is illegal. Yesterday, the force was urged to launch a wider review amid claims that racism against these groups has become ‘part of police culture’. The Traveller Movement charity said the comments suggest a ‘canteen culture of racism towards gipsies and travellers’. A Metropolitan Police spokesman said concerns were first raised in April, and that officers from the force’s directorate of professional standards are investigating. One of their key tasks is to assess whether any of those who posted racist comments are serving officers. What has festered for years has been the outrageous behavior of this group. And btw, we have ourselves come to meet some of the vermin and not to our benefit. There’s a reason so many resent and hold negative views of these …. sub humans. The property they trash, the trash and the garbage they leave behind after an uninvited visit. Laws don’t apply to them, the only laws that matter are the ones they make for themselves. Everything becomes a matter of race with bed wetting politically correct left. When people are angry or frustrated they need an outlet. Short of killing ( which I don’t oppose in a good cause ) people often use terms that are not those of endearment. But more and more words and expressions are being made up and declared unPC and racist. Well F*** em all. This group has gone out of its way to insure that the general public can not stand the sight of them. Oh yeah … just what were some of the awful things the cops said in what they thought was private conversation. Well f*** me if that isn’t a hanging offense, what is? I’m damn tired .... back aches from being at this thing but this has to be shared. In the news today .... take a look. Then tell me cops don’t have cause to speak of the devil amongst themselves using whatever language or expressions that fit the bill. Oh and nor just cops. How about the folks in communities across the country who have had to put up with these miserable bastards. For YEARS! And mustn’t say naughty things cause they are an ethnic minority these days. Gipsies from across Europe have arrived in Nottingham for a two-week summer holiday so they can visit sites associated with Robin Hood. Travellers from France, Sweden and Morocco have pitched up on private land next to the city’s BioCity Science Park so they can visit Sherwood Forest and Nottingham Castle. The illegal campers, consisting of more than 60 people, said they want to learn more about England’s most famous outlaw as many can relate to Robin Hood and his ‘band of merry travellers. Local residents have given a mixed reaction to the arrival. Builder Kevin Parry, 30, from West Bridgford, said: ‘They are on private land and should not be there. It is a real eyesore. Jonathan Henley, 32, who lives in the city centre, added: ‘I suppose they are entitled to a summer holiday just like everyone else, although I do wonder what they all do for a living. But Paul Spinks, 35, of Sneinton Hermitage, Nottingham, said: ‘It’s the first time we’ve seen them here and it doesn’t bother me. A spokesman for Nottingham City Council said the travellers had moved onto private land and therefore have no power to move them. Earlier this month, a group of gipsies from Monte Carlo had to be evicted after setting up camp in Swansea for the fourth year running. The group, made up of 30 families driving campervans, caravans and BMWs, travelled to Strasbourg in April, before stopping off at Calais and London en route to the South Wales coast. They had broken a padlock to get their caravans through a gate on to public land, popular with picnickers and local sports teams. According to angry locals, the illegal campers turned a nearby footpath into a public toilet and littered the park, according to angry locals. In 2011, a convoy of French gypsies set up camp on a village green in London while they spent a holiday sightseeing in London. Eleven caravans, with all 40 gypsies said to be from the same family, descended on Mabley Green in Homerton, Hackney, East London.